Each frequency has a spiritual purpose. The UT,RE,MI,FA,SOL,LA is a singing scale and each note is sung using the correct syllables. It is a diatonic musical scale and singing exercise. I am using a Neurosky BCI unit to inform my sound design. 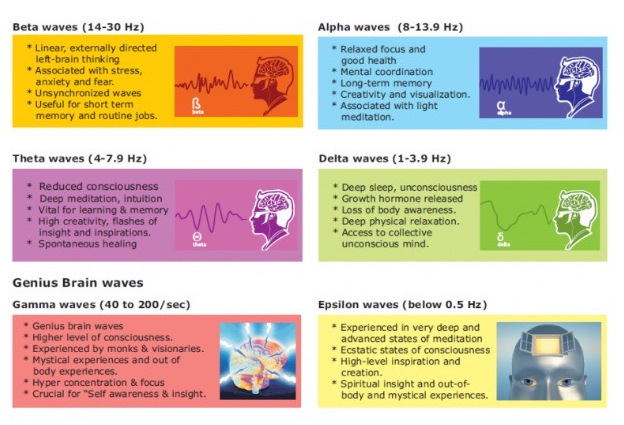 I have researched into brainwave frequencies and will be using the information on Beta, Alph, Theta, Delta frequencies as below. I have been trying to use Mindwave mobile with Brainwave OSC 0.93 platform but use is only on PC. It has been very unpredictable due to the out of date software for brainwave mobile. 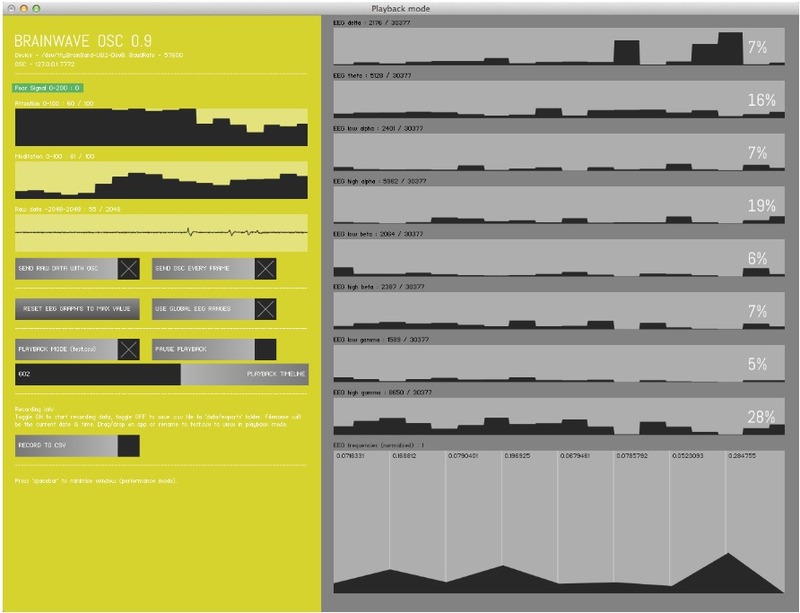 Using Brainwave OSC 0.93 allows data from Mindwave mobile to be converted into either MAX MSP or Pure Data , both these programs will enable me to edit and design sound forms. I was trying to assign the port B584 but port would not assign, then I started to look at Baud Value of mindwave which was 9600, I went to Github and discovered that the management platform for Mindwave mobile Thinkgear will not work with Brainwave OSC. I have been researching and demonstrating the process of creating sound from data using soundforge.net, tones.wolfram.com and also Pd-0.43. After trying these programs I have decided to use a program I am more familiar with called Cubase as this will allow me to spend more time on the production of 5.1 end result. 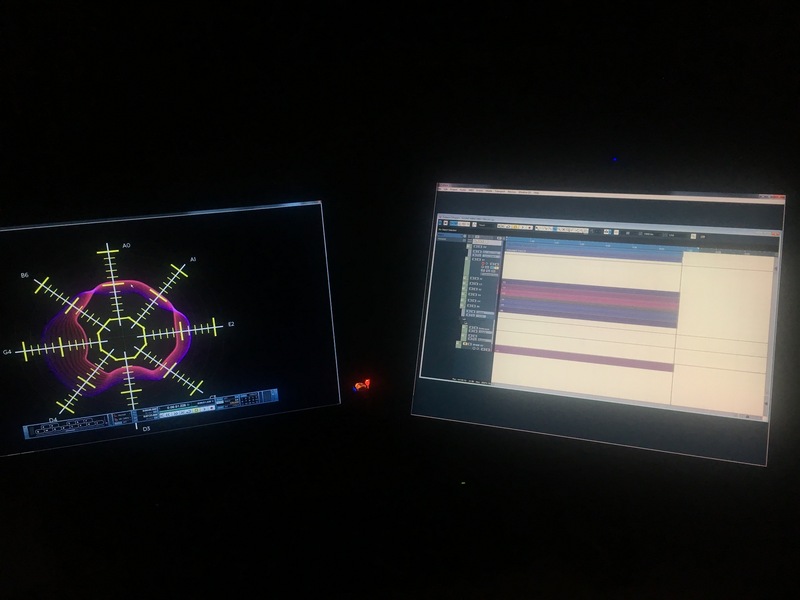 Another very interesting piece of work that has helped inform my process is ewic_ev14_s13paper1 an EEG controller is programmed to create visual and music in response to the brain. I have found a graph and also a website that converts a frequency into notation which will enable me to sing the notation in relation to the brain frequency. 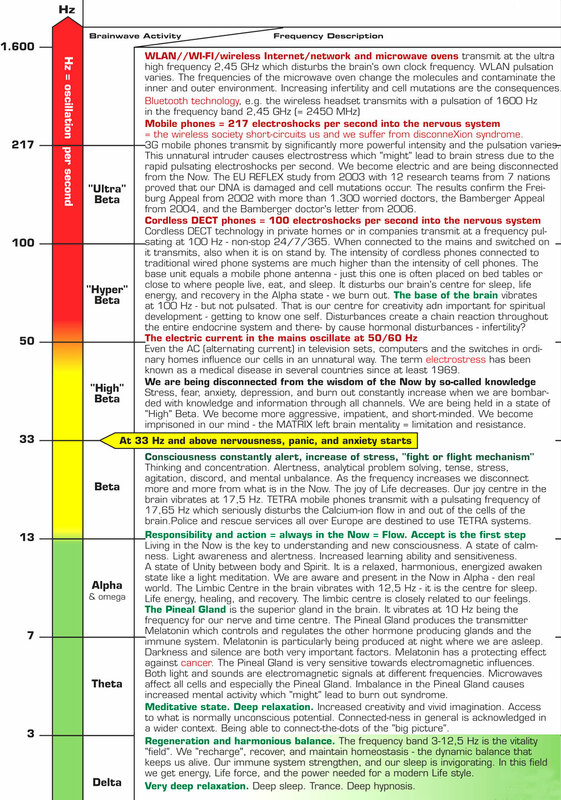 An example is High Beta is 14-30Hz = A0. I used this graph and the footage in video editor window within cubase. Here is the home set up I used for the first part of the composition. 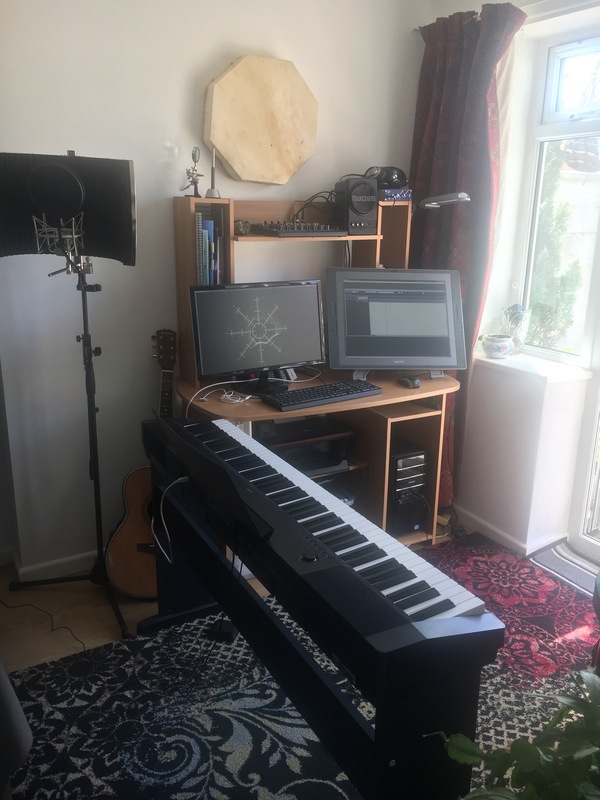 It was important that I used a full size piano which has made it much easier in converting the notes, especially when you’re having to play A0 and B6. I played the piano in real time whilst watching the brain activity footage. I created sound files for each brain frequency. I was unaware of how all the various notes would fit with each other but I was very surprised to find that the notes were harmonic and complimented one another. 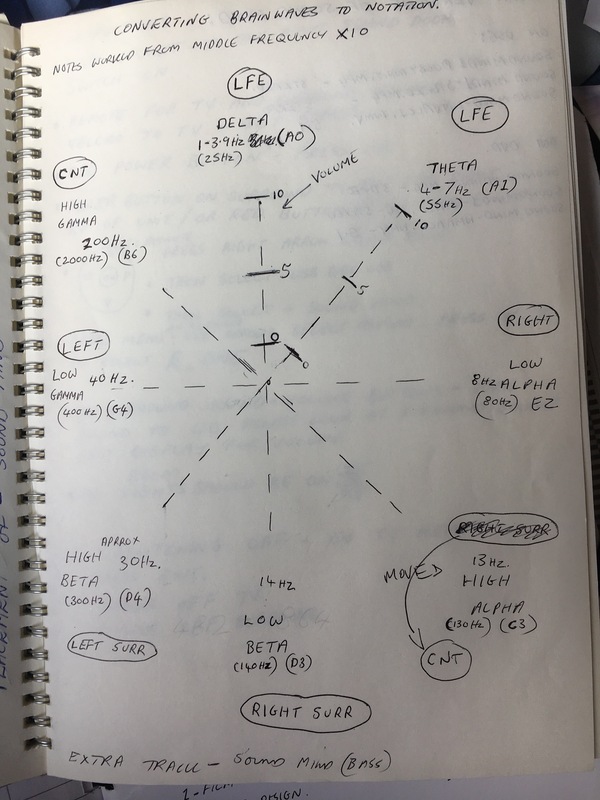 The composition needed a baseline so I assigned Delta wave: note A0, Theta: note A1, and Low Alpha E2 as base synth sounds, which gave the composition a body and platform. I did consider using after effects to edit the sound files using keyframes for volume and velocity on the separate tracks, but then I decided to play the notes live which would enable me to give a more human touch, and I could express the intensity of the wave using soft or hard pressure on the notes. I worked out that if I used 1-second points of reference for keyframes to change amplitude, I will be making 3360 reference points. Open up cubase, create new file, click new track choose the instrument, then I choose Halion – embrace, I altered each track so they are slightly different and equalized them so that the frequency they represent was more prominent. I created the instrument tracks as midi so that at a later date I can assign new sounds to the files. In the below window you will see the editing window for cubase and I had it set to 5.1. I would like to say the transition from being able to mix in stereo to 5.1 has been smooth but it has not, its a very confusing world of file types, musical delivery such as Dolby atmos, dolby digital, 7.1 and it goes on. 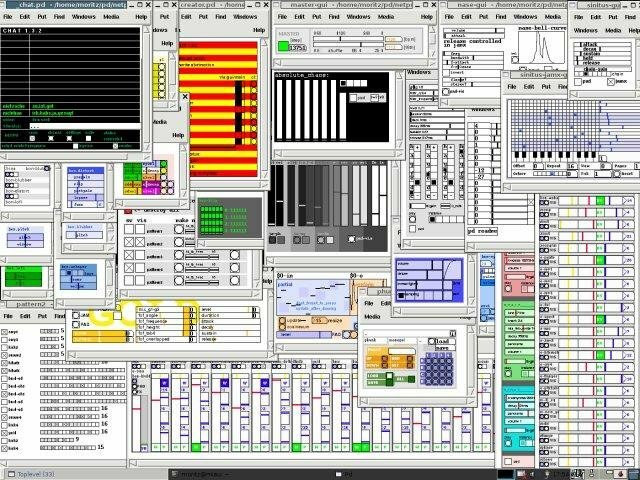 I discovered that I could mix down in Premier Pro, Audition and also Cubase and where I could stick with Cubase I did, but I crossed over a lot doing certain things in other programs becuase it was easier. Problems I have incurred in Creating 5.1 Surround and being able to play it from another source other than computer. I was prepared to settle for a stereo mix for Sound Mind because I was advised against it, and the Uni does not have the required equipment to achieve 5.1 sound. I have been concerned about settling for stereo as it did not sit with my concept of being immersed within the sound, concept being that all our cells and surroundings are constantly communicating and resonating in response to sound and frequencies within our surroundings. I did have a few surround sound systems at home but they were not aesthetically pleasing and required being fitted into the wall spaces. Whilst trawling the second hand buy and sell sites, which is something I do as relaxation, I came across a surround sound system that was free standing and would mean that it will immerse the audience within the sound, so I purchased it. The original way that I was going to present Sound Mind if it was in stereo was putting the film and sound on usb plugging straight into the Tv, tv attached to two stereo speakers and place the tv settings on loop, but adding the 5.1 has thrown up some technical issues that have to be worked through. Ok, here we go, On the back of the surround sound system, there are two sets of input options. Left and Right stereo input. This will run the system as a standard stereo system, with things on the left side coming out of the left front and the left back speaker and things on the right coming out of the right front and the right rear speaker. The bass just comes out of the bass bin as bass tends to be too long a waveform to have much in the way of stereo functionality in the home setting. The other inputs, where each speaker has its individual input, normally six of them, Front left. Front right, centre, bass, rear left and rear right is what is needed for it to function as a 5.1 surround sound system, which is what you get out of a 5.1 surround sound DVD player, with a 5.1 surround sound DVD playing in it. 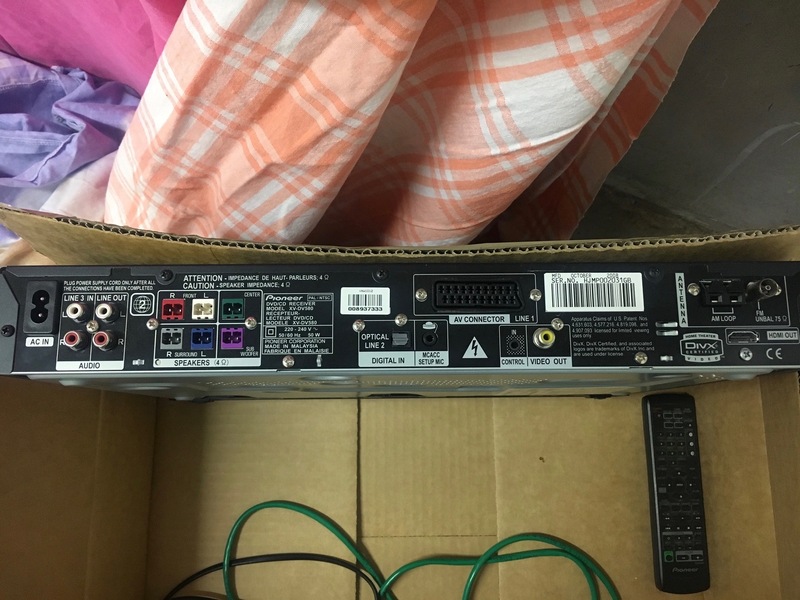 So I will need to connect DVD player to TV, but most importantly I will need to able to burn a 5.1 surround sound DVD. If my DVD burner will only burn standard DVDs then it won’t work and I will only get stereo, or dolby digital which distributes the frequencies around 5.1. Secondly, I need to check to see if DVD burner will burn a looping DVD. Some do, some don’t. Obviously, a loop is what I need , so you can just set it going and leave it forever. If it doesn’t loop, then I will have to look at playback options. I need to burn DVD before exhibition time and check all these variables. I have managed to burn a DVD at Bang Productions which is a professional film studio, the DVD plays in the home theater system and also loops. 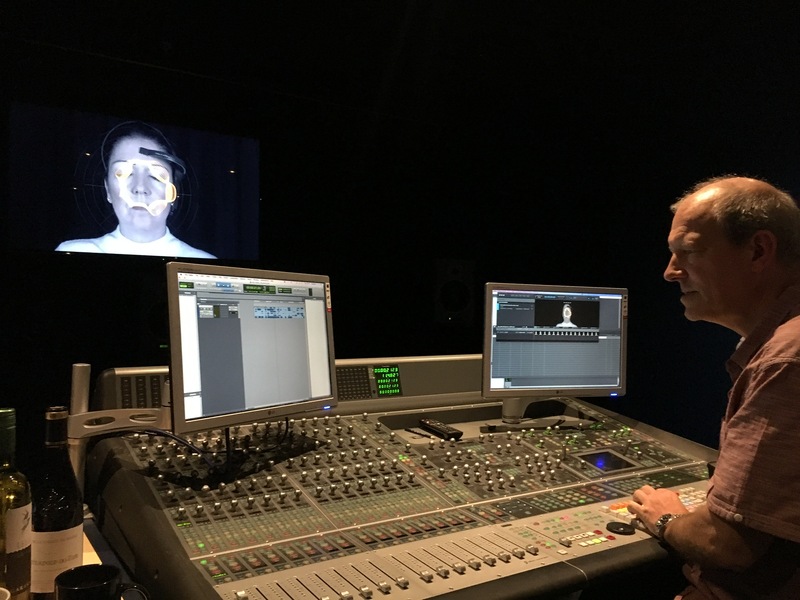 I have also been able to monitor the sound files via a Dolby Atmos system, this is something that would always be done on a music file it is called mastering and happens for radio plays etc. It is done to improve the sound quality and make sure the file plays and sounds similar through many different systems. 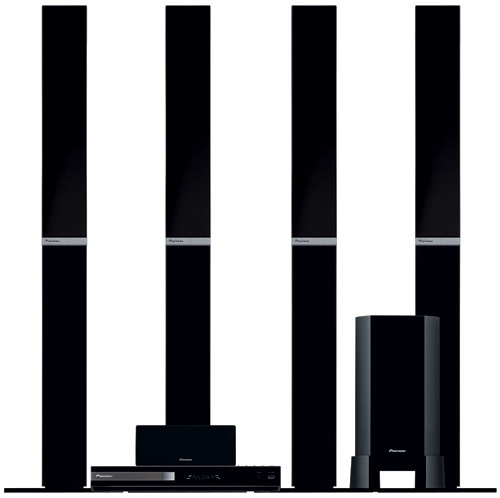 The sound is not true 5.1 its is dolby digital where the sound gets distributed around the speakers. I have given the tutor the option of the presentation been given at Bang Production studios but they are unable to do this. I could bring in to Uni a computer, the 5.1 soundcard and also the 5.1 surround sound speakers but this set up is to complicated for the people to set and shut down every day. So I have decided to stick with DVD. 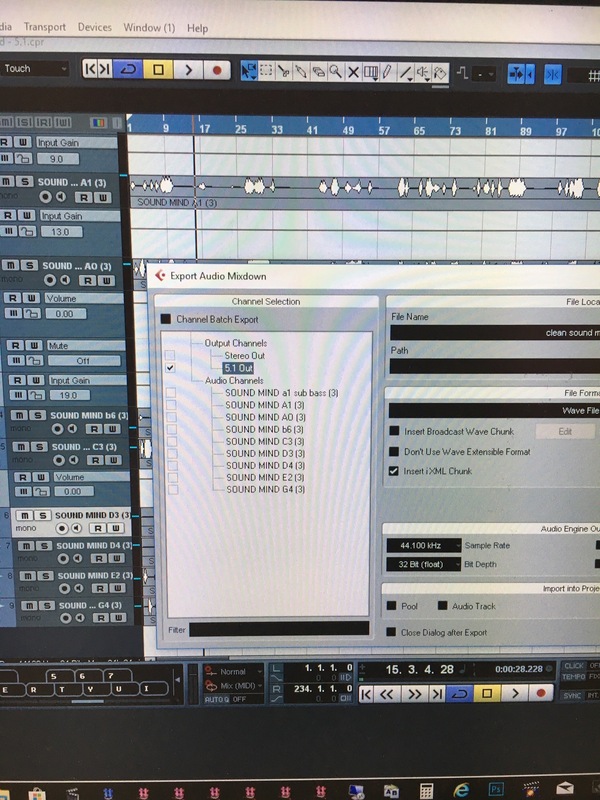 Creating the 5.1 in Cubase 5. I had to research about 5.1 sound cards as my computer did not have one, neither was the equipment in Uni set up in 5.1, I was advised against going down the development of a 5.1 sound production but I had already comprised my work and was not going to comprise on this ,but a friend of mine did. 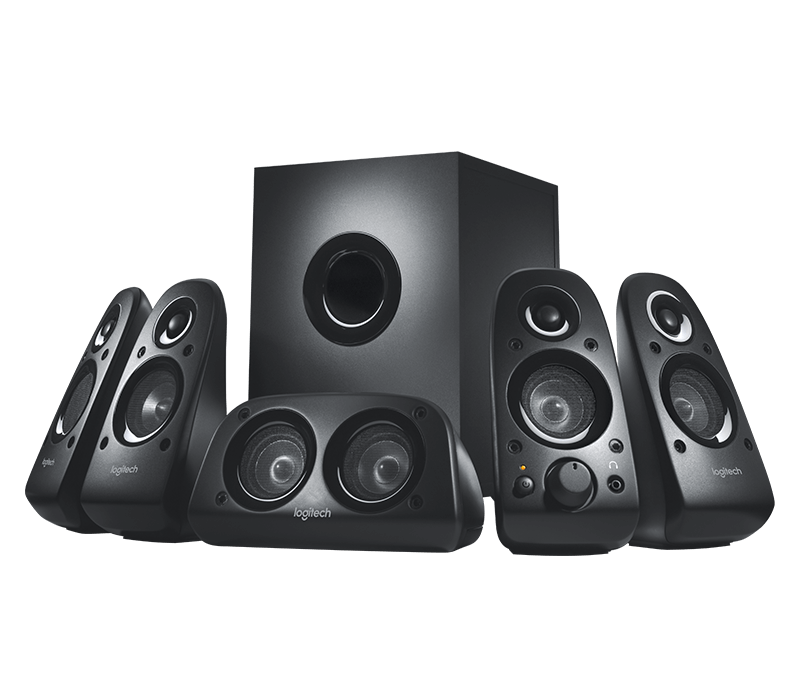 I purchased Z506 5.1 SURROUND SOUND SPEAKER SYSTEM Surround Sound Speakers in Currys to enable me to correctly mix down all the 8 tracks. So I created a new file: setting inputs and outputs- add output tab 5.1 configurations. This entry was posted in Year 3 on April 13, 2018 by liannemorgan.